Happy hump day! Being that it is hump day, it is time for another installment of Wednesday’s “What is It?”. I challenge you to guess what my picture is today. My hope is that this picture is a true challenge. I think it is a tough one. In fact, I think it is so tough, I am going to offer a prize to the first two folks that guess correctly. The prize? I will donate $25 to a charity chosen by the first place winner in honor of that person, and I will donate $15 to a charity chosen by the second place winner in honor of that person. It’s a winch of some sort but the only winches I’m familiar with are boat winches. Am I close? That is very clearly a doohickey. I was fooled for a moment into thinking it was a thingamajig, but I am most certain it’s a doohickey. Swing and a miss, HC. You should have stuck with thingamajig. Oh well. Maybe you’ll get it right next week. The riggings for a bicycle chain? Pulley for a drive belt for a motor of some type. Crisis Pregnancy Center is my charity of choice. Yay Carol! Yay Lee! Yay yay Carol Lee! I knew you could do it. Hmmm. Ummm. Oh! Can opener? Your American wisdom is great, Nancy. You nailed it. I can’t help but think that I might be spending too much time in the kitchen to have guessed that correctly. I hope you took the week off. You know… you are not the first to say, “This is a tough one…” followed by “can opener”. I’m thinking it is not too tough. I’ll stump you yet! I know! It’s a whatchamacallit! No, it’s a thing-a-ma-jig. No. Hmmm. You have me stumped. Wait!! Is it a can opener?? Look at you pulling it out at the last minute. Well done, Susan! 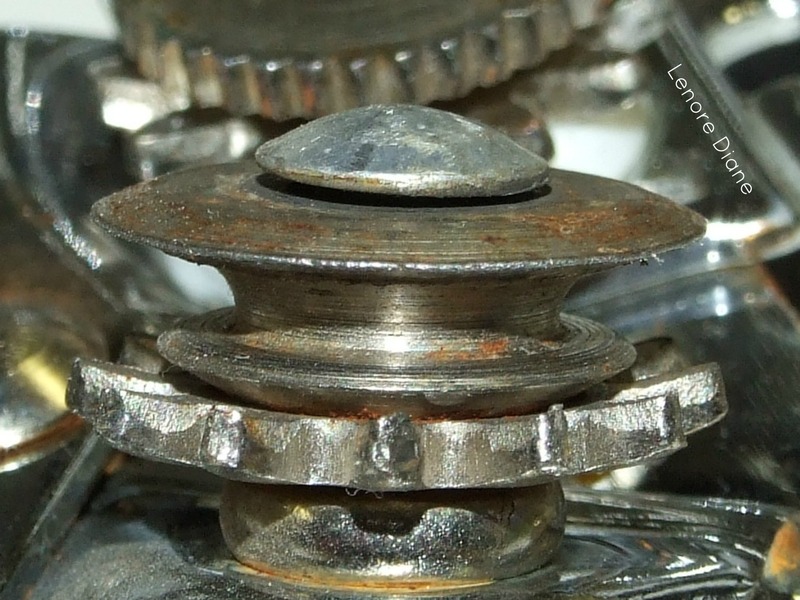 I was originally going to guess that it was the inner workings of a sewing machine – possibly an early model Husquarva – but upon closer inspection, I realized it was a can opener! Can opener is my final answer, Regis! Is it wrong that I wished you had gone with your first guess? *sigh* You guys are all so smart. Oh well, I must give you the credit you are due. Congrats, 1Pt. You guessed correctly.